No electrical discontinuities longer than 1 microsecond. 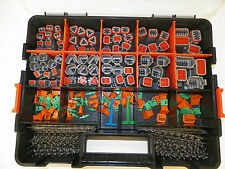 384 piece weatherproof DEUTSCH DT Connector Kit. No electrical discontinuities longer than 1 microsecond. 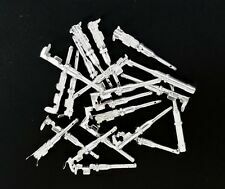 Includes120 female & 120 male pins ,21 male connectors & 21 female connectors for a total of 42 connector assembly. 100 seal plugs ,1 crimping tool ,1 removal tool ,1 connector box. Deutsch Connectors. 3 Way Components is based in Luton, Bedfordshire, England. 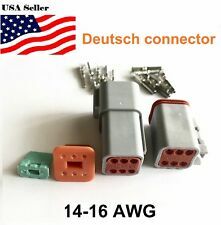 Genuine Deutsch DT Series Size 16 Electrical Connector Box Set – Supplied in a Handy Storage Box. Genuine Deutsch DT Series Electrical Size 16. No electrical discontinuities longer than 1 microsecond. 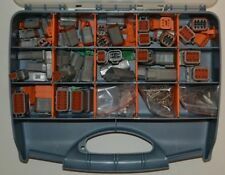 Includes120 female & 120 male pins ,21 male connectors & 21 female connectors for a total of 42 connector assembly ,1 crimping tool ,1 removal tool ,1 connector box. Deutsch Connectors. 3 Way Components is based in Luton, Bedfordshire, England. 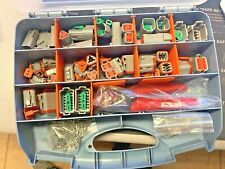 Genuine Deutsch DT Series Assorted Electrical. 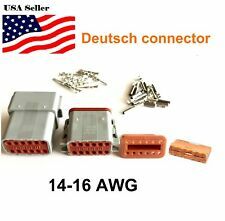 Genuine Deutsch DT Series Size 16 Electrical Connector Box Set – Supplied in a Handy Storage Box. TOTALS 518 PIECES. 2X female 12. 3X female 9. 4X female 9. 2X male 12. 6X female 6. PIC TOOL FOR WEDGE LOCK REMOVAL. 8X female 2. Deutsch DT03 3 Pin Engine Gearbox waterproof electrical connector for car bus motor truck. Black color Deutsch DT06-12S DT04-12P 12 Pin Engine Gearbox waterproof electrical connector for car bus motor truck. 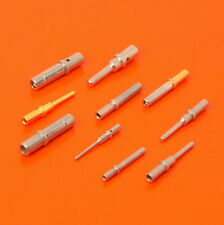 This style uses the solid style barrel crimp tools. 0460-202-20141 CAN BE USED WITH 20 AND 22 GAUGE WIRE. 3 x Size 8 pin connector. 3 x Size 8 socket connector. 3 x Size 12 pin connector. 3 x Siize12 socket connector. 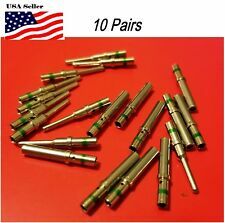 3 x DT06-3S-J1939 plugs plus Wedges. 20 x Wire blank seals. 2 x DT06-3S-J1939 plug (120 ohm resistor). 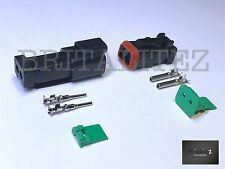 Deutsch DT02 2 Pin Engine Gearbox waterproof electrical connector for car bus motor truck. 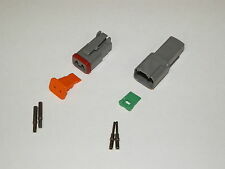 THESE ARE USED WITH THE DTM SERIES CONNECTORS. Wire Gauge OEM# 1062-20-0122. 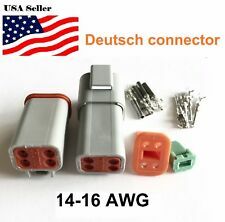 Deutsch Connectors. 1 x 3 Way Y Receptacle DT Series Housing. Genuine Deutsch 3 Pin Y Receptacle Connector Housing. Available in standard inline, flanged receptacle and boot adaptor options. Connector Style: Receptacle. #20 FEMALE SOLID for 18-20-22ga. #16 FEMALE SOLID for 16-18-20ga. #16 FEMALE SOLID for 14-16-18ga. #20 MALE SOLID for 18-20-22ga. #12 FEMALE SOLID for 14-12ga. #16 MALE SOLID for 16-18-20ga. #16 MALE SOLID for 14-16-18ga. #20 FEMALE SOLID for 18-20-22ga. #16 FEMALE SOLID for 16-18-20ga. #16 FEMALE SOLID for 14-16-18ga. #12 FEMALE SOLID for 14-12ga. #20 MALE SOLID for 18-20-22ga. #16 MALE SOLID for 16-18-20ga. #16 MALE SOLID for 14-16-18ga. WITH GREEN STRIPE. Wire Gauge: 14 ga. This sale is for 100 pcs pins. CONNECTOR NUMBERS ARE DT04-2P AND DT06-2S. THIS IS A READY TO USE MATCHING SET FOR 16-18-20GA WIRE. 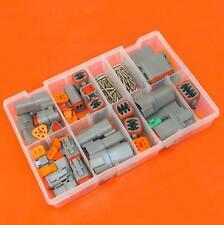 DEUTSCH GRAY DT SERIES 662 PIECE SOLID KIT. DEUTSCH PART #. OEM REMOVAL. AT REMOVAL. GREEN OEM #16. BLUE OEM #16. From the person who makes the kits. Yes up to 10:00 am PO closes at 12pm. Black color Deutsch DT06-12S DT04-12P 12 Pin Engine Gearbox waterproof electrical connector for car bus motor truck. Complete set Black color with Solid crimp pins. DEUTSCH GRAY DT SERIES 179 STAMPED KIT. DEUTSCH PART #. GREEN OEM #16. From the person who makes the kits. COMPARE US TO OTHERS BEFORE YOU BUY AND SEE THE DIFFERENCE. Yes up to 10:00 am PO closes at 12pm. #16 FEMALE SOLID for 20-18-16. #16 FEMALE SOLID for 14-16-18ga. #20 FEMALE SOLID for 22-20ga. #12 FEMALE SOLID for 14-12ga. #16 MALE SOLID for 16-18-20ga. #16 MALE SOLID for 14-16-18ga. #20 MALE SOLID for 22-20ga. Deutsch DT06-12S DT04-12P 12 Pin Engine Gearbox waterproof electrical connector for car bus motor truck. DEUTSCH GRAY DT SERIES 662 PIECE SOLID KIT. DEUTSCH PART #. OEM REMOVAL. AT REMOVAL. GREEN OEM #16. BLUE OEM #16. LARGE PLASTIC CASE. From the person who makes the kits. 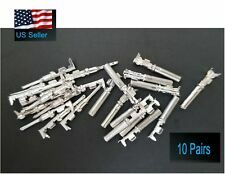 100 PCS Deutsch Solid Female Socket Size 16, 0462-209-16141 14ga. This sale is for 100 pieces. Unopened bag of 4000 pieces of Deutsch 38941-12L gold plated connectors. #16 for 20-18-16ga wire part 0462-201-16141. #20 FEMALE SOLID for 22-20ga. #16 FEMALE SOLID for 20-18-16. #16 FEMALE SOLID for 14-16-18ga. #12 FEMALE SOLID for 14-12ga. DEUTSCH DT SERIES. #20 MALE SOLID for 22-20ga. 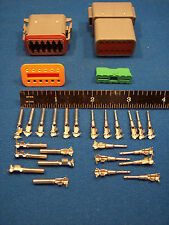 8 pin Deutsch connector set. Male and Female. 1 EA Cavity Plug with seal DT04-8PA. 1 EA Cavity Socket with seal DT04-8SA. 8 EA Solid Pins 0460-202-16141. Deutsch DT04 4 Pin Engine Gearbox waterproof electrical connector for car bus motor truck. This style uses the solid style barrel crimp tools. 0462-201-20141 CAN BE USED WITH 20 AND 22 GAUGE WIRE. PIC TOOL FOR WEDGE LOCK REMOVAL. INSERTION TOOLS FOR 16GA AND 18GA. TOTALS 504 PIECES. STAMPED FEMALE 16-18-20. STAMPED MALE 16-18-20. STAMPED FEMALE 14-16-18. REMOVAL TOOLS 16-18 GAUGE. NOTE THAT THE SMALL BLACK TOOL IS NOT OEM IT IS A TOOL WE MAKE.